Freak Show is located on the west side of the river ten minutes up the Riverside Walk trail. Look for a large boulder and locate the bolted slab Pitch 1 on the up-river side of the boulder. 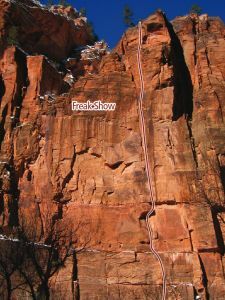 Freak Show is a high quality route with sustained difficult climbing and chances are you will be surrounded by, or become the Freak Show. Which SuperTopo guidebooks include a topo for Freak Show?